How do you store your fishing kayak in between trips out on the water? I'm talking about bigger (wider), heavier fishing kayaks that don't seem to fit products made for other recreational kayaks - your Hobies, Old Towns, Ocean Kayaks, Native Watercrafts...Most likely you rest your kayak in the corner of your garage, or maybe you’ve gone one step further and put together something to rest your kayak on to try and keep it out of harm’s way. 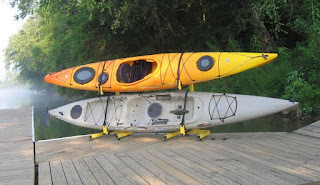 Considering the investment you made to purchase your kayak, and the enjoyment you get out of it, it’s worth considering a proper fishing kayak storage rack. Here are a few different types of racks that solve your kayak storage problems and keep your kayak in tip-top shape while it’s not being used. Fishing Kayak Wall Rack: This rack is probably what you think of when you think of a storage rack. 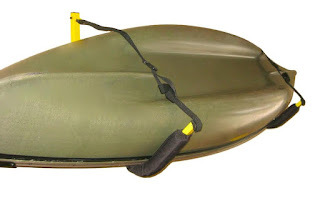 It’s a simple yet sturdy and practical wall rack to store a single kayak up off the ground. This wall rack is designed with fishing kayaks in mind, as it can hold kayaks weighing up to 150 pounds and with hulls up to 34 inches wide. Its steel construction can take a beating! It’s also padded to protect your hull, and comes with straps to make sure your kayak doesn’t go anywhere unless you want it to. Freestanding Fishing Kayak Rack: If you’re looking to store multiple fishing kayaks, this freestanding kayak rack is the answer for you. It comes in a 2 kayak rack or a 4 kayak rack depending on how much storage you need. Because it’s a freestanding rack, you can set it up wherever you want, and with the optional wheel kit, you can roll it back and forth between different storage locations. Its steel construction also makes it a great outdoor rack, on your dock or your deck or wherever else you need storage. Its unique suspension storage system means your kayaks are stored without pressure points, avoiding damage to your kayaks. Fishing Kayak Portable Work Stand: This is another freestanding kayak rack built for a single fishing kayak. Its design is truly simple yet sturdy, and sets up and breaks down for a portable rack that you can take anywhere. Use it at home in your garage, outside near the water, and take it with you and your kayak when traveling. It’s ideal for suspending your kayak to work on it, clean it, or store it between trips. Built with an aluminum frame, this kayak stand can hold kayaks up to 100 pounds. Fishing Kayak Trailer / Cart: How about when you're ready to hit the water, how do you transport your kayak around? 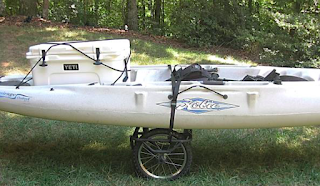 You need a heavy duty transport option like this Fishing Kayak Trailer. It's a sit-on-top trailer, so your kayak's width shouldn't be restricted by the design. Padding between the trailer and your kayak makes sure your kayak doesn't suffer any damage on a bumpy trip to the water. But the biggest and best feature of this trailer is its wheels. The wheels are heavy duty, airless (no flats) tires that can traverse conditions that other carts fail on - sand, gravel, dirt, curbs, you name it. This cart'll save you a lot of energy getting your kayak to the water, energy you'll have to reel in the big one.